In working on the 1965 set, I felt a little ripped off that I didn’t get to include a Don Mossi in it. 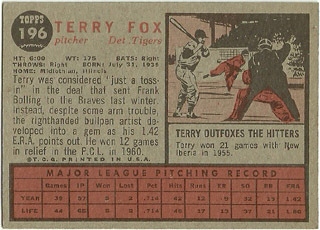 He appeared in every Topps set from 1955 to 1964, and returned for a curtain call in 1966, but was left out in ’65. He’d been released by the White Sox in October of ’64 and wasn’t signed by KC until the end of May, ’65, so that may have had something to do with it. 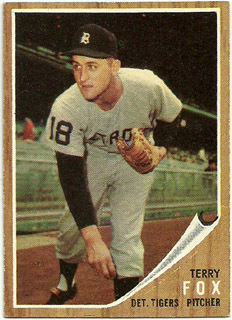 Which makes it all the more funny that he’s in the 1966 set, since he never appeared in a game (majors or minors) after ’65. Many people consider Mossi one of the ugliest men to ever play major-league baseball. I won’t be that unkind, but he definitely has to be one of the most unique-looking. What often gets overlooked in all that talk about his appearance is what a good pitcher the guy was. As a rookie in 1954, he went 6-1, 1.94 in 93 innings of work, teaming with Ray Narleski to give the Indians a fantastic left-right combo out of the ‘pen and helping them to their then-record 114 regular-season wins (his success continued in the World Series, hurling 4 scoreless innings over 3 games, but the Tribe couldn’t keep up their winning ways and were swept by Willie Mays and the Giants). After a couple of more top-notch years of relief-work, Cleveland moved Mossi to the starting rotation in 1957, where the results probably weren’t what they hoped for (11-10, 4.13 in 36 games, 22 starts; ironically, he made his only All-Star team that year). A return to the bullpen the following season didn’t seem to improve things very much, and he was shipped off to Detroit along with Narleski and Ossie Alvarez for Billy Martin and Al Cicotte. Given a second opportunity to be a starter by the Tigers, Mossi didn’t waste it. He averaged 14 wins a season over the next 3 years (peaking with a career-high 17 in 1959) with a 3.23 ERA and never lost more than 9 games. 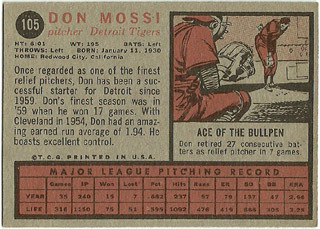 The year this card was released, Mossi’s success as a starter began to wane, and Detroit finally sold him to the White Sox during spring training of 1964. Moving back to the bullpen full-time brought back some of his success of 10 years earlier, and as mentioned previously, he signed on with the Athletics for one final season in May of 1965, turning in a decent effort on a last-place team. He retired with a career record of 101-80, a lifetime 3.43 ERA, 50 saves, and the highest fielding percentage among pitchers (.990). February 7th, 1962: The United States bans all imports from (and nearly all exports to) Cuba. Singer Garth Brooks is born. But better late than never, and I’ve created this blog to track my progress. It won’t be witty, and it may not even be very interesting or informative. But at least it’ll help keep me off the street and away from drugs and gangs, right?